There is just something fun about eating festive colored food around a holiday. What kid doesn’t love drinking green milk? Or green pancakes for St. Patrick’s day? If you can make the colored food naturally colored using whole foods and add some nutrition in there then win, win win! Right? 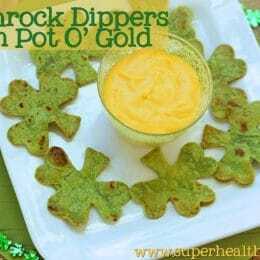 These shamrock dippers are super simple to make and they are crispy and delicious. 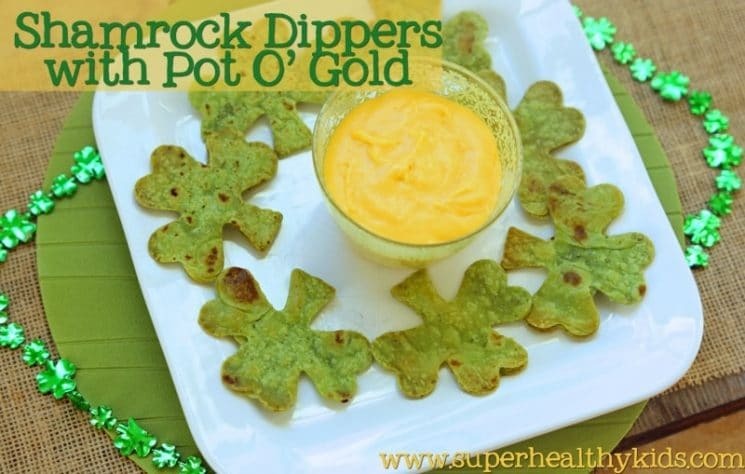 A perfect snack for your little leprechauns! See the recipe below to make the Pot O’ Gold Cheese sauce. You will need spinach tortillas, a shamrock shape cookie cutter, and a little bit of oil. Cut your shapes out of the tortilla. Depending on your cutter, you might have to push firmly and wiggle it around a bit to get it to go through. You can use the extra part of the tortilla also (those parts can be for the adults 🙂 ) Then brush with a little oil. Place on a baking sheet and bake in the oven for 8 minutes at 375 degrees F until crispy. That is it! Dip them in your cheese sauce, or you could also use hummus, or salsa. Healthy holiday foods can create fun memories and traditions for your children. What fun things do you serve on St. Patrick’s Day?? 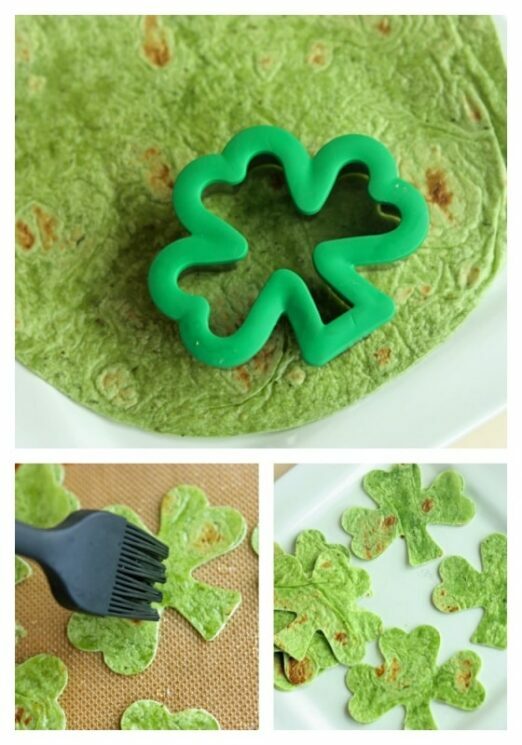 Cut shamrock shapes out of the tortilla. Place on a baking sheet and bake for 8-10 minutes or until crispy. Serve with cheese sauce, hummus or salsa. In a medium-size saucepan, melt butter. Mix in flour and salt. Stir continually until it is paste-like. Slowly pour milk into the mixture. With a whisk, continuously stir over medium heat until the mixture has thickened. Stir in cheese and mustard. Continue stirring until all of the cheese is melted and the dip is smooth. Serve warm after adding salt and pepper to taste.